The thoracic outlet is a space which is formed by the first rib, the clavicle, the anterior scalene and the posterior scalene muscles. Various structures traverse through the thoracic outlet. 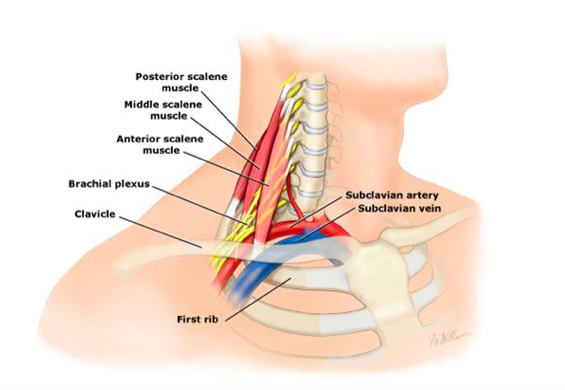 The brachial plexus and the subclavian artery pass over the first rib between the anterior and middle scalene muscles within the thoracic outlet. The brachial plexus is a network of nerves that supply the skin and muscles of the upper limb. These nerves branch from the spinal cord and travel through the neck, over the first rib and into the armpit. There are three spaces in the thoracic outlet region that have been identified as potential areas of brachial plexus compression. 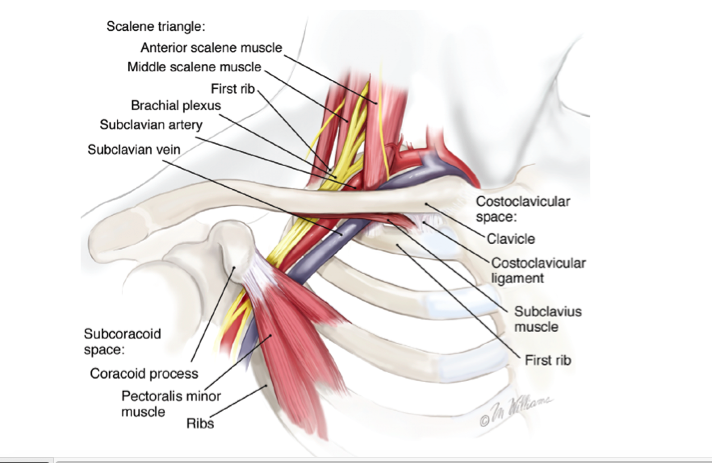 This triangle is made up of the anterior scalene muscle, the middle scalene muscle and the first rib. The brachial plexus passes behind the anterior scalene and travels down towards the armpit region. The clavicle, subclavian muscle and the costocoracoid ligament create this space. The back the space is made up of the scapula and the first rib and scalene muscle insertions. 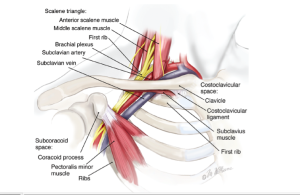 The brachial plexus travels through this space and moves under the clavicle towards the subpectoralis minor space. This space is located underneath the coracoid process of the shoulder blade and behind the pectoralis minor muscle. Here the brachial plexus travels underneath the pectoralis muscle towards the armpit. The current belief is that TOS is caused by bony or soft-tissue anomalies and or tension/spasm of these structures in the thoracic outlet region. Local muscle spasm in the thoracic outlet region can result in muscle swelling and place the nerves or vessels under strain or traction. As the condition becomes more chronic scarring and fibrosis of the nerve can take place. Sleeping Position: Many people experience increased symptoms at night due to sleeping position. Sleeping on the affected side or sleeping with the affected arm in an overhead position can increase symptoms. Try to avoid sleeping on the affected arm. To help you sleep on your back you could try placing pillows under each arm or between the body and involved arm when lying on your side. Activity Modification: Limit aggravating postures or activities as much as possible – i.e. : rest from working with arms overhead, swimming. Rest from vigorous aerobic activity: Vigorous aerobic activity can increase scalene activity so a rest from these activities may help initially. Avoid carrying heavy objects with affected arm. Supportive Bra: Large breasts can also cause sagging shoulder postures, which decrease the space for the brachial plexus. Wearing a good support bra with crossed posterior straps helps to reduce nerve pressure. Breathing Patterns: diaphragmatic breathing can help reduce activity of these muscles and can help to increase costoclavicular space. Addressing improper breathing techniques can help to reduce symptoms of TOS. Posture: improving posture can help to limit strain on the thoracic outlet. Varying sitting and standing postures while at work is most important. The body is put under excess strain holding any position for too long. 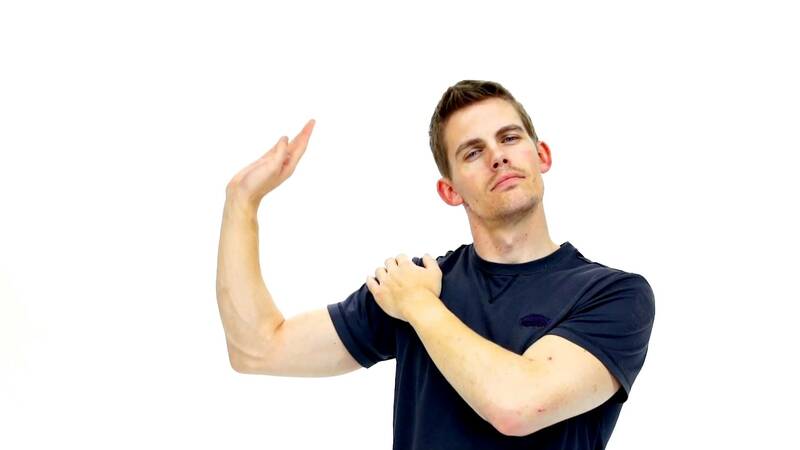 Restoring normal joint function in the shoulder and surrounding areas (neck, upper back, AC, SC joints). Reducing related muscle, facia and nerve tension. Improving nerve mobility to decrease tension on the brachial plexus in the thoracic outlet. Decreased TOS symptoms have been reported following improved mobility of the first rib through manual therapies such as mobilization and manipulation. Following manual therapy techniques used may lead to a “release phenomenon” in which patients experience increased symptoms (especially upper extremities numbness & tingling). This can indicate a normalization of nerve function, which is associated with unloading the brachial plexus. Mobilization of the cervical and thoracic spine may also help to unload the region of the thoracic outlet. Cervical traction has also been shown to help reduce symptoms. Mobilization of the SC and AC joints can also help to restore normal end range joint function of the clavicle during elevation activities, which may decrease the costoclavicular space. Overuse of the scalenes which help with breathing, may result in elevation of the first rib, thereby reducing the costoclavicular space. Releasing the scalenes through soft tissue therapy and muscle energy techniques helps reduce tension and spasm in these muscles, which can decrease nerve compression & increase the costoclavicular space. Narrowing of the thoraco coraco pectoral space can result from shortening of the pec minor or major muscles. Releasing the pec muscles through soft tissue therapy and muscle energy techniques helps reduce tension and spasm in these muscles, which can decrease nerve compression & increase the thoraco coraco pectoral space. Cervical (neck) range of motion exercises focussed on maintaining good alignment. Motor control and stability functional rehabilitation exercises for proximal muscles of the trunk, neck and shoulder. Stretching and mobility exercises targeting tight muscles including: scalenes, pec minor, levator scapulae, pec major, coracobrachialis, pronator teres etc. These exercises will reduce fibrous bands and adhesions in muscles compressing the brachial plexus. Exercises for fine motor skills of the hands. Progressive cardiovascular training for those with poor aerobic capacity. Weight loss for overweight individuals. If neural mobility is limited, neural mobilizations are incorporated to improve gliding of the neural tissue in relation to the other surrounding tissues.